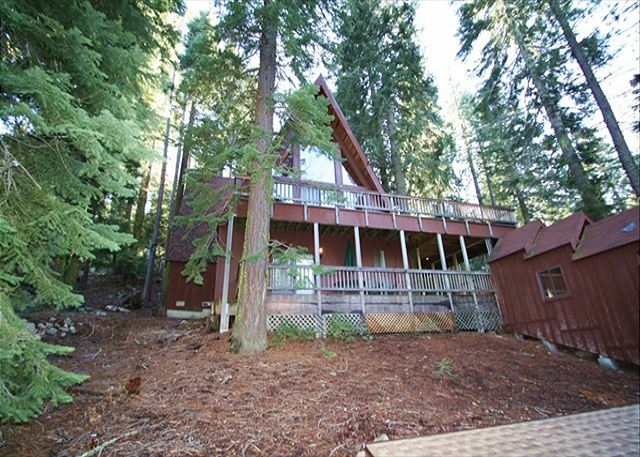 Truckee, CA United States - Hornberger 083 | Donner Lake Realty, Inc. The Hornberger unit is a 5 bedroom, 3 bath, sleeps 10; located on South Shore DR. There is parking for three vehicles in the garage for compact cars only as well as parking for one vehicle in driveway parallel to garage doors. There are approximately 40 stairs up to the front door. You enter the unit at the laundry area with a bathroom to the left featuring a tile shower and granite counter tops. Past the entry way is a family room with a couch, TV, PS2, game table and wood burner. 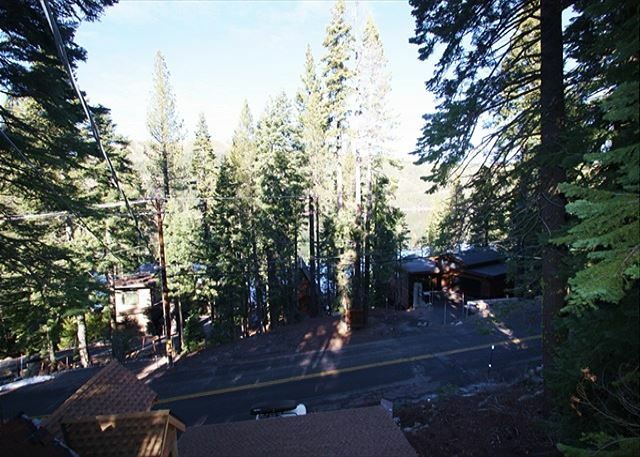 If you walk up the 15 stairs to the middle level you will find the grand room featuring large bay windows to see the filtered Donner Lake view. It has a large flat screen TV, nice newer couches and chairs. On the middle level you will also find the kitchen featuring granite counter tops, stainless steel appliances and new wood floors. To the right of the kitchen is the large dining area with a grand wood dining table as well as new wood flooring. Down the hall on the middle level you will find 2 of the 5 bedrooms. The first bedroom has a new queen bed and the other room has a new king bed. There is also a bathroom on this level with a tile shower and granite counter tops. Take the 12 stairs to the top level where the remaining 3 bedrooms as well as bathroom are. The bedroom to the right features a new King size bed. The bedroom in the middle has 2 new twin beds. The bedroom to the left has a new king size bed. The bathroom on this level has a tile shower/tub as well as granite counter tops. 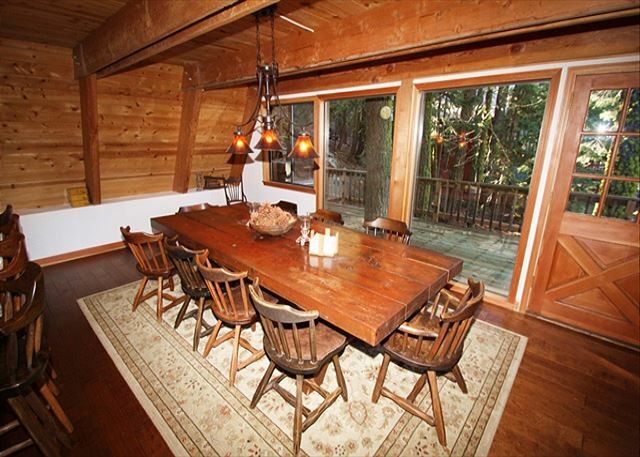 There are large decks off this unit featuring filtered views of the lake. Pet Friendly . Our units do not have sheets, pillow cases, or towels included in the rental, guests are requested to bring their own. However, we do offer linen rental service with 72 hrs notice before arrival: sheets, pillow cases, and towels at a onetime fee of $10 per person. Check in time is 3pm and check out time is 10am. **Nightly Minimum Subject to Change for Holidays** 4 night minimum for Thanksgiving, 7 night minimum for Christmas/New Year's, 3 night minimum for Martin Luther Holiday Weekend, 3 night minimum for Presidents Holiday Weekend, 3 night minimum over the 4th of July, 3 night minimum for Labor Day holiday Weekend.